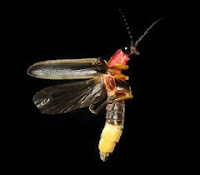 Linda Shenton Matchett: Forensic Friday: What do Mining, Fireflies and CSI have in Common? Forensic Friday: What do Mining, Fireflies and CSI have in Common? Crime scene investigation is predicated on the theory that no crime can be committed without leaving some sort of evidence behind. Even the tiniest trace. That’s where the chemical Luminol comes in. When mixed with an appropriate oxidizing agent, Luminol exhibits a soft, blue glow. This reaction is known as chemiluminescence, and it’s the same phenomenon that makes fireflies glow. hemoglobin (blood). During testing, the room is darkened, and the CSI technician sprays the chemical evenly across the suspected area. If blood is present, whether fresh or dried, the area will glow for about thirty seconds, and the effect can be documented by a long-exposure photograph. 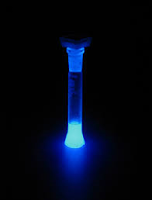 The intensity of the glow does not indicate the original amount present, but indicates only the distribution of trace amounts of substance left behind. Most people don’t realize that tiny particles of blood will cling to most surfaces for years. Other substances do cause Luminol to glow, so additional tests are required for verification of the results. And because the chemical reaction can destroy other evidence, Luminol may be used only after pursuing other investigative options. It is not used as readily as shown on many television programs. I was surprised to discover the chemical was originally designed in the 1920s for the German copper mining industry to reveal new sources of ore. It was not until 1937 that German forensic scientist Walter Specht made extensive studies of applying Luminol to crime scenes. 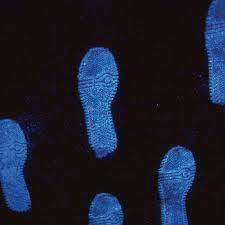 Further study was done in 1939 in San Francisco that helped convince law enforcement officers of Luminol’s importance as a crime solving tool. What other industries have contributed to crime solving?